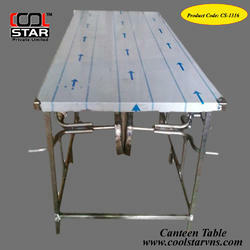 we are engaged in presenting an impeccable range of Canteen Tables Heavy Steel. It is one of the most used and applied tables in the canteen. These tables have been developed adhering to industry standards and quality norms. In addition, such fabrication has helped us assure clients about the durability and safety of the tables. Eight to twelve people can sit at a time comfortably using the tables. Besides, clients can get the tables from us at industry leading rates. Looking for Canteen Table ?